I was reading about AsyncTask, and I tried the simple program below. But it does not seem to work. How can I make it work? I am just trying to change the label after 5 seconds in the background process. Storing and reading data from large text files. UI thread synchronization and management. Want to perform an infinite loop work. How to use AsyncTask in your App? Create a subclass of AsyncTask. Override doInBackground() and other methods. Make an instance of AsyncTask subclass & call execute(). Params - data used to start background thread execution. Progress - data that used to notify progress of the task. Result - data that return from doInBackground() after execution. AsyncTask helps us to update UI within their methods. These methods runs on Main Thread. That's why you can update UI elements. and call AsyncTask using execute() method. How to execute AsyncTask in serial and parallel? How to memorize the parameters used in AsyncTask? If you are new to AsyncTask then it is very common to get confused while writing an AsyncTask. Main culprits are the parameters used in the AsyncTask ie AsyncTask<A,B,C>. Based on the A,B,C (arguments) signature of the methods differs which makes thing even more confusing. The key is Don't memorize. If you can visualize what your task really needs to do then writing the AsyncTask with the correct signature at the first attempt would be a piece of cake. Just figure out what your Input, Progress and Output are and you will be good to go. So what is an AsyncTask? 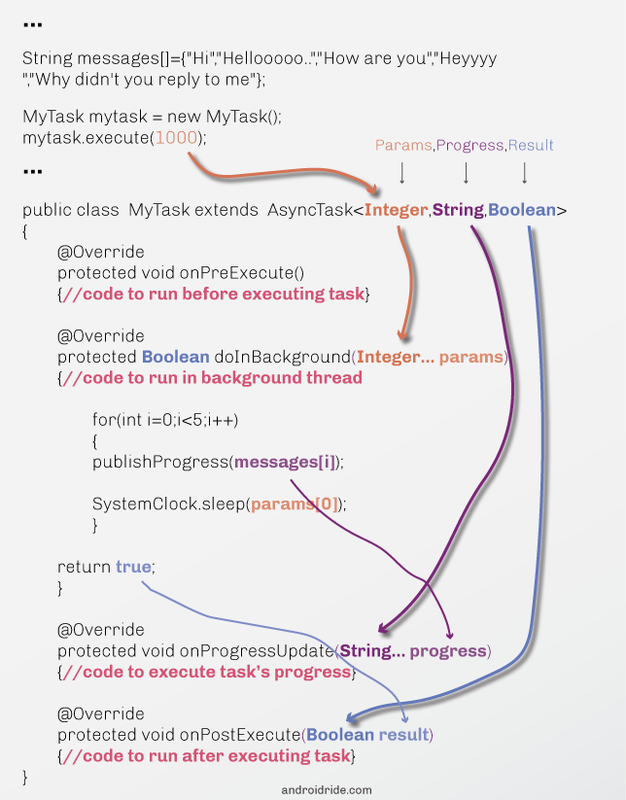 AsyncTask are background task which run in the background thread. It takes an Input, performs Progress and gives Output. What is the relationship with methods ? How to write that in the code? How will you run this Task? AsyncTask allows you to run a task on a background thread, while publishing results to the UI thread. The user should always able to interact with the app so it is important to avoid blocking the main (UI) thread with tasks such as downloading content from the web. This is why we use an AsyncTask. It offers a straightforward interface by wrapping the UI thread message queue and handler that allow you to send and process runnable objects and messages from other threads. Params - the type of the parameters sent to the task upon execution. Progress - the type of the progress units published during the background computation. Result - the type of the result of the background computation. call execute() with parameters to be sent to the background task. 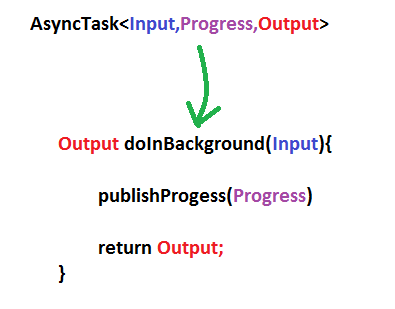 Must override at least doInBackground() to use AsyncTask. This causes onProgressUpdate() to be called. On the background thread, a result is returned from doInBackground(). This triggers the next step. On main/UI thread, onPostExecute() called with the returned result. 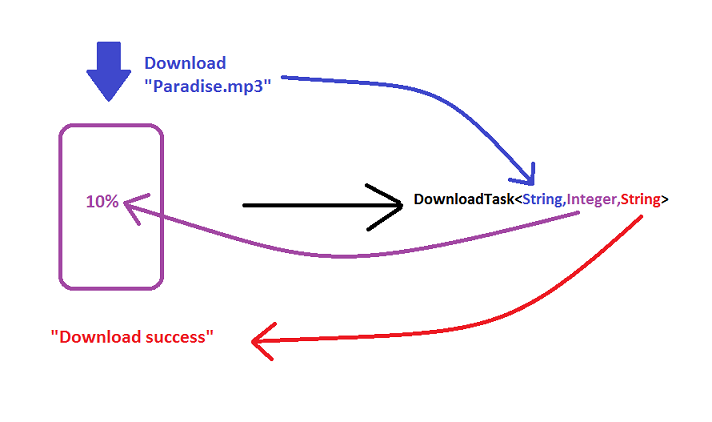 while Example B downloads some files. The doInBackground() method downloads the image and stores it in an object of type BitMap. The onPostExecute() method takes the bitmap and places it in the ImageView. Very nice.. But I keep getting error about return type clashing - attempting to use incompatible return type. I have tried all sorts of return types, same error. I have created a simple example for using AsyncTask of Android. It starts with onPreExecute(), doInBackground(), publishProgress() and finally onProgressUpdate(). In this doInBackground() works as a background thread, while other works in the UI Thread. You can't access an UI element in doInBackground(). The sequence is same as I have mentioned. However if you need to update any widget from doInBackground you can publishProgress from doInBackground which will call onProgressUpdate to update your UI widget. I'm sure it is executing properly, but you're trying to change the UI elements in the background thread and that won't do. Note: I personally suggest using onPostExecute() wherever you execute your AsyncTask thread and not in the class that extends AsyncTask itself. I think it makes the code easier to read especially if you need the AsyncTask in multiple places handling the results slightly different. yes, finally someone decouples the task and the activity. thank you.And overriding the onPostExecute in the activity is brilliant. When you are in the worker thread, you can not directly manipulate UI elements on Android. When you are using AsyncTask please understand the callback methods. // Here you can show progress bar or something on the similar lines. // Since you are in a UI thread here. // After completing execution of given task, control will return here. // Hence if you want to populate UI elements with fetched data, do it here. // Here you are in the worker thread and you are not allowed to access UI thread from here. // Here you can perform network operations or any heavy operations you want. FYI: To access the UI thread from a worker thread, you either use runOnUiThread() method or post method on your view. This will help you know the things better. Hence in you case, you need to set your textview in the onPostExecute() method. Ok you are trying to access the GUI via another thread. This, in the main, is not good practice. The AsyncTask executes everything in doInBackground() inside of another thread, which does not have access to the GUI where your views are. preExecute() and postExecute() offer you access to GUI before and after the heavy lifting occurs in this new thread, you can even pass the result of the long operation to postExecute() to then show any results of processing. You will then see your TextView text updated after the doInBackground completes. EDIT: I noticed that your onClick listener does not check to see which View has been selected. I find the easiest way to do this is via switch statements. I have a complete class edited below with all suggestions to save confusion. // because we implement OnClickListener we only have to pass "this"
// detect the view that was "clicked"
I am unable to do this <code> btn.setOnClickListener(this); </code> Eclipse gives an error ----- "The method setOnClickListener(View.OnClickListener) in the type View is not applicable for the arguments (AsyncTaskActivity)"
I would advise changing the setting of the text to not be static but take the argument from the onPostExecute(String result) method. It would make it clearer for future readers that the argument is populated by the return value of doInBackground(String... params). @Eric Tobias - That exact things done in the commented section already. I was following and answering the users question in my full example. @Graham Yes, lets not go to that dark place please! ;) Thank you for your correspondence. I now do understand your reason and can only agree. Thank you for taking the time to reply. As an addendum and google seeder (and coming from someone currently learning this stuff which is how I came across this) : the majority of UI updates you'll do for something where you need progress reported back to the user is in the call back onProgressUpdate which is executed in the main UI thread. @Sam - Yes, but that is NOT what the OP was asking. The question relates to making an AsyncTask work not what the pit falls or alternatives are of using one. Fair enough. Just pointing it out. It might be worth highlighting in the answer (esp as it's very highly up-voted) as this can be an easy way to shoot yourself in the foot. @Graham Smith, is it possible to access Views like TextView of another activity ( txt.setText("Executed");) within a separated AsyncTask's class? 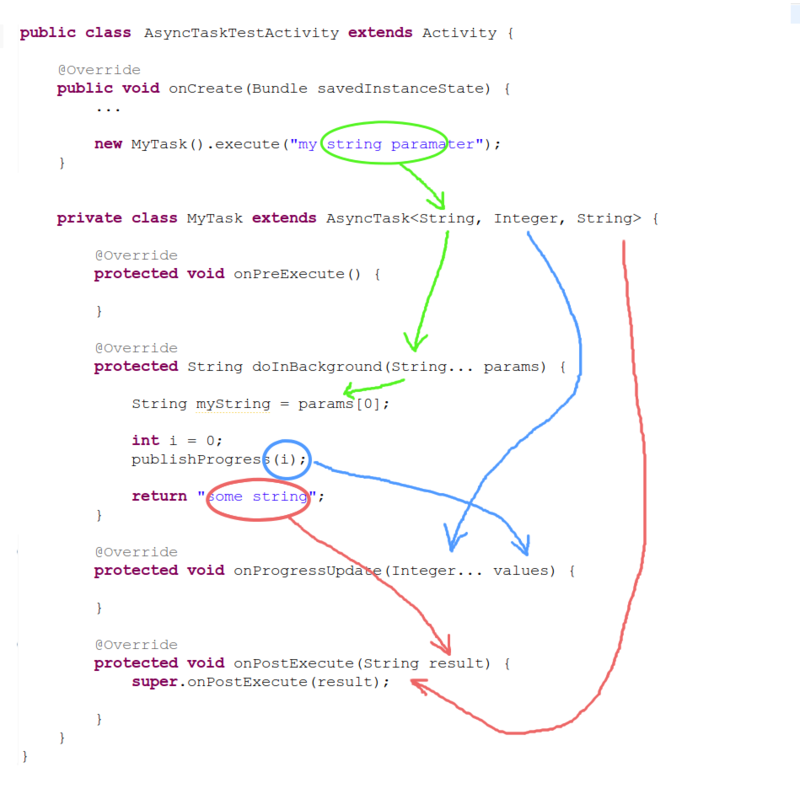 like to put the asynctask in a separated .java file (not as an inner class). There are ways of doing that, however I would not use AsyncTask for anything, as it is the path to a dark and horrid places. params is an array. (In the example above, it was a String array.) This allows you to pass in multiple parameters of the same type. Then you can access those parameters with params, params, params, etc. In the example, there was only a single String in the params array. If you need to pass in multiple parameters of different types (for example, a String and an int), see this question. Hey what i am running async task on service i want to return some value to main ui thread. @Dipen - Check out this discussion. There are two issues: reporting results from an AsyncTask, which my answer addresses; and sending a value from a service to the ui thread, which the other discussion addresses. These issues are independent.